A trademark is a word, name, or symbol, or a combination of these, (or in very rare cases a color, sound, or other device) adopted and used by a company to identify its products (e.g., sneakers or software) and to distinguish them from the products of others. A service mark is a type of trademark used to identify services (e.g., real estate leasing, travel services, or computer programming) rather than tangible products. A trade name is the name of a company under which business is conducted (e.g., International Business Machines). Some words or phrases (such as “IBM”) may be used in more than one category. New Products: If you are working on the development of a new product or service, consider unique, creative, distinctive marks rather than those that merely describe the product or service. The more distinctive the mark, the better it will identify the product or service in the marketplace and the easier it will be to protect. The proposed mark must not conflict with another mark already in use by another person or company in connection with similar goods in a given geographic area. When you are ready to check a proposed mark or marks, please contact an attorney to determine availability. Applications for Registration: It is usually a good idea to register a mark with the U.S. Patent and Trademark Office and similar authorities in relevant countries. To apply for registration of a mark, you will need to provide your lawyers with the date it was first used in interstate or international commerce on goods or in connection with rendering services (e.g., the first ship date of software bearing the mark in a standard commercial transaction) and with a copies of packaging, labels, or product bearing the mark. It is also possible (and advisable) to file an application for a mark that the company intends to use, but has not used yet. Using TM, SM, and ®: If a mark is registered, use ® as a superscript following the mark. Alternatively, one of two acceptable longer notices may be used as a footnote to a registered mark. These notices are: “Registered in U.S. Patent and Trademark Office” or “Reg. U.S. Pat. & Tm. Off.” Different countries have different marking requirements, and in some countries failure to properly mark one’s goods can result in the inability to enforce one’s mark against infringers. Please contact an attorney if you need to know the marking requirements of a specific country. If an application for registration of a mark is pending, or if you claim rights in a mark but have decided for some reason not to register it, use the superscript TM (for trademarks) and SM (for service marks). Use these symbols with, at least, the first or most prominent use of a mark in each main section of a print or electronic publication. 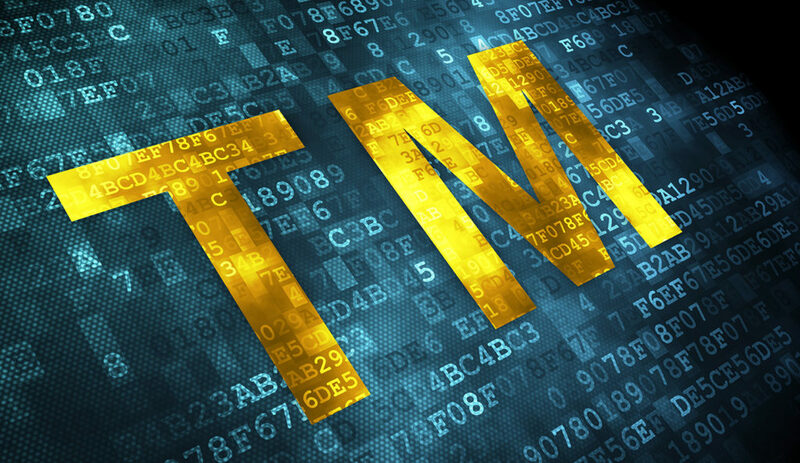 Although use of the TM and SM symbols has no bearing on whether the term or logo is properly considered a trademark or service mark, their use helps to deter potential infringers and to make clear that the company claims the term or logo as a trademark. Do not use a trademark symbol with your company’s trade name. Remember to properly mark and use trademarks belonging to other companies. In some cases, it may also be necessary to obtain permission to use other company’s marks. Using marks in text: Trademark rights can be lost if marks are not used properly. In press releases, advertisements, labels, packaging, brochures, marketing materials, and other print and electronic publications, please follow these guidelines. • Use marks as adjectives, followed by the generic name of the product or service that the mark identifies, e.g., “NIKE® sneakers” or “KLEENEX® tissues.” Do not use marks as nouns, e.g., “KLEENEX® is exceptionally strong.” On occasion, the generic term may be omitted, as in repetitive uses of a mark in a single piece, but always use the mark in combination with the generic term at the beginning of a piece and again at subsequent significant points. • Make a mark typographically distinctive, i.e., use it in bold or italic type, with an initial capital letter or all capital letters to distinguish it from the generic noun it describes and from other words in the text.